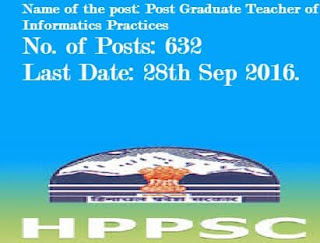 HPPSC or Himachal Pradesh Public Service Commision have invited Online recruitment Application candidates for the posts of Post Graduate Teachers (Informatics Practices) Class-III (Non-Gazetted) (on Contract basis) in the Department of Higher Education, Himachal Pradesh through ORA, which shall be available on the Commission’s website up to 28th September, 2016 till 11:59 P.M.
Last Date: 28th Sep 2016. Candidates between 18 and 45 years are eligible to apply for this post. degree from a recognised University / Institute. from a recognised University/ Institute. 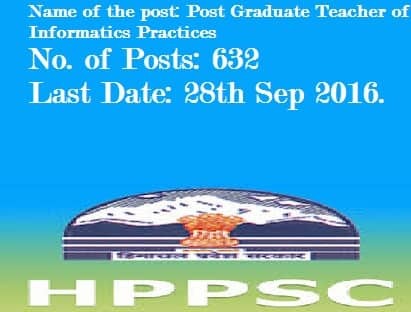 (iii) Proficiency in teaching in Hindi and English. for appointment in the peculiar conditions prevailing in the Pradesh. general BPL,S.C. of H.P. /S.T. of H.P. /O.B.C. of H.P.- 100 Rs. Candidates have to apply online through official website of the Commission. After submitting the Online Recruitment Application(s) (ORA), the candidates are required to take a printout of the finally submitted Online Recruitment Application and submit the same along with requisite self attested/ attested documents / certificates in support of their eligibility to the Commission on the day of Screening Test for the concerned post. Mode of Payment is through e-challan.